Grey is the new trend for Fall/Winter clothing. One of my favorite color combination this season has to be Hot Pink and Grey. There's something about the bold pink hue combined with an otherwise boring neutral that makes it fun winter look. You know I love my pink! It really makes this casual outfit pop. 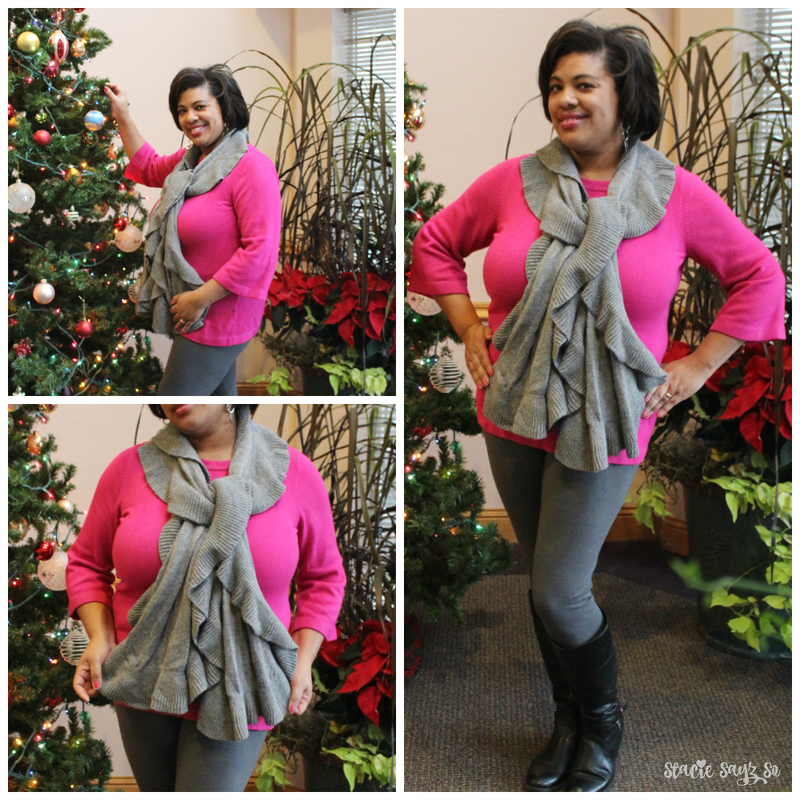 Similar Grey Scarf, Similar Grey Leggings, Hot Pink sweater- different. It has been so warm outside and I'm glad I'm still able to wear my leggings. Soon I'll be busting out the jeans and thick sweaters. In the mean time, I'll enjoy this beautiful December weather. What do you think? Are you wearing pink and grey this season? Lovely look!! I realized that I don't have an ounce of pink or grey in my wardrobe either. Sounds like a good excuse for a shopping trip! It sure is sis. Happy shopping! I like the look you put together. I love to see pink and grey paired! It is one of my favorite color combinations. Grey is really a staple color this fall. Pink and grey are my favorites too. I love how they look together. I wear pink and gray often. You look absolutely beautiful! I like to wear pink and grey together. I am going to be trying out fleeced lined leggings this winter to see how they hold up to the cold. That's a great idea. Let me know how they work for you. My personal style has been so drab lately. I definitely need a pop of color like pink & grey. Pink is great for adding that pop to brighten up your day. Do you? Wow! It's my all time favorite lol! Pink and grey are probably my favorite colors so of course I love them together. You look great. I hear ya! I've been enjoying this mild air. I like the look. I think you look great. Love the color combo. Looking good! I am all about pops of color. I especially love hot pink, just love it! I think this is a great color combo too. I bet you look great in hot pink! I really love this color combo! I wouldn't have thought pink and grey but it really works. I love the scarf as well. Great outfit. Thank you dear. They really do work well together. I've always loved the pink and grey combination...so pretty. Cute outfit! The pink and grey combo looks fabulous! That shade of pink looks great on you! I love the pink and grey combination and you look lovely in pink!!! These colors look good together. I ear pink daily, just need to go get some grey leggings and chinos. A.L. I wear pink a lot myself.